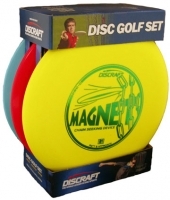 The perfect Disc Golf set for beginners by Discraft. An ideal way to start with this fascinating sport - well prepared and at low price. The discs and colors may vary from set to set and can't be chosen. It is always a well balanced selection of Pro-D or Elite-X discs.